Go surfing and swimming at popular Yallingup Beach near the Margaret River wine region. Yallingup Beach has it all - from big waves offshore, to a sheltered lagoon perfect for safe family swimming. It's also a popular place to learn to surf. Sign up for a learn-to-surf course and soon you could be mixing it with the best of them on those big Margaret River waves. Spend some time here and you might even spot world class surfers like Taj Burrows who hails from this pristine part of Western Australia. Yallingup Beach is a popular place for a family holiday. There's a camp ground nearby and plenty of other accommodation. 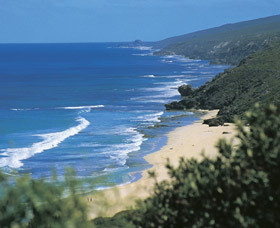 Yallingup Beach is around half an hour's drive west of Busselton. It takes around three and a half hours to drive from Perth to Yallingup Beach.